Elvis Enthusiasts Unite: My KRCL love letter. Last night I waded through two-and-a-half hours of music that I was lucky enough to share with those listening to their radios. 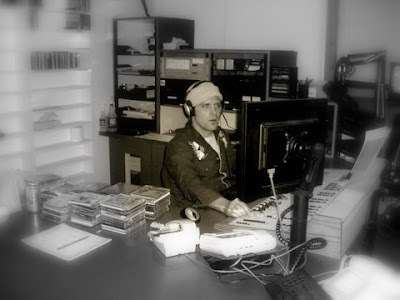 It was my very last program as a DJ for KRCL. I’ve been there for almost five years, volunteering my time in a variety of ways: subbing for other programs, filming musicians who’d stopped by to perform, representing the station at festivals/concerts and, well, that list goes on. Even as the station was being reorganized, I had a sense of pride about it all. I felt like I'd helped, in some small way, to build what it was becoming. Barring that, it’s just been a lot of fun, too. Not a lot of forethought was put into this final show, but I played a lot of my favorites: Wilco, Ghostland Observatory, The Black Keys, The National, Bon Iver, Radiohead, Peter and the Wolf. I’ve done that most weeks, too, but last night hit me like that proverbial ton of bricks. When the tears came (and kept coming), it was a surprise to me, but I didn’t try to keep them back. It just became a matter of wiping my face off and composing myself between sets of music. And, when some listeners called to wish me well, I don’t think they were able to tell that my heart was as heavy as it was. To keep things in perspective, then, I’ve had girlfriends I’ve never shed tears over. There are goodbyes that’ll happen in a week I believe will be pretty easy to say. This, however, surprised me. More emotion bubbled to the surface than I ever thought was there. I’ll miss sharing daily and weekly musical discoveries with Salt Lake City and beyond. I’ll miss simply talking to other like minds about it, too. I’ll miss everything about the relationship and connection that has developed. There's just so much there. Time will likely change things, but the feeling I had last night will be a hard one to shake. As general and as all encompassing as this is … thanks, KRCL. I listened in last night. Do you think you made the right decision to go? Just when I found your show and your musical inspiration - you're leaving. I won't lie. I'm a little sad about this. But, wish you well in your new adventure. bless your tender heart. your last show was a great one. i mean great. damn, i'll miss my thursday night tunes from the Mountain Man (and J & S). i wonder if you'll ever love a girl as much as you love music? i want you to, but i think you have already found your soulmate... a dusty record that evokes tremendous feelings that humans aren't capable of making each other feel. i fall in love with a new song almost every day.